Marquaille, Céline (2008). "The Foreign Policy of Ptolemy II". In McKechnie, Paul R.; Guillaume, Philippe (eds.). Ptolemy II Philadelphus and his World. Leiden and Boston: BRILL. pp. 39–64. ISBN 9789004170896. O'Neil, James L. (2008). "A Re-Examination of the Chremonidean War". In McKechnie, Paul R.; Guillaume, Philippe (eds.). Ptolemy II Philadelphus and his World. Leiden and Boston: BRILL. pp. 65–90. ISBN 9789004170896. Arsinoë II was a Ptolemaic queen and co-regent of the Ptolemaic Kingdom of ancient Egypt. Ptolemy III Euergetes was the third king of the Ptolemaic dynasty in Egypt from 246 to 222 BC. 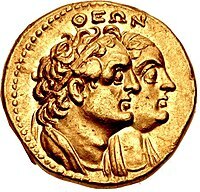 Ptolemy I Soter was a companion and historian of Alexander the Great of the Kingdom of Macedon in northern Greece who became ruler of Egypt, part of Alexander's former empire. Ptolemy was pharaoh of Ptolemaic Egypt from 305/304 to 282 BC. 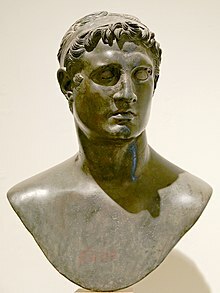 He was the founder of the Ptolemaic dynasty which ruled Egypt until the death of Cleopatra in 30 BC, turning the country into a Hellenistic kingdom and Alexandria into a center of Greek culture. Berenice I was Queen of Egypt by marriage to Ptolemy I Soter. She became the second queen, after Eurydice, of the Ptolemaic dynasty of Egypt. Magas of Cyrene was a Greek Macedonian nobleman and King of Cyrenaica. 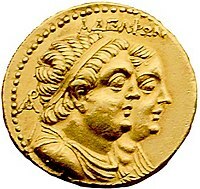 Through his mother’s second marriage to Ptolemy I he became a member of the Ptolemaic dynasty. He managed to wrestle independence for Cyrenaica from the Greek Ptolemaic dynasty of Ancient Egypt, and became King of Cyrenaica from 276 BC to 250 BC. Arsinoe I was Queen of Egypt by marriage to Ptolemy II Philadelphus.